A few days ago, I had to make a user in a local AD appearing as a contact in O365 address book. Today I had to make a script to compare the Distribution group members between our on-premise environment and the cloud to bee sure that they all are consistent. After some search, I found that in the command “Import-PSSession” use to connect the Exchange (cloud and on-prem) environment, you can use the parameter “prefix” which will be used to make the difference between the on-premise commands and cloud commands. This, decrease my script time execution from 35 min to less than 5 minutes ! Following the article on this new feature, you maybe now want to give access to someone to it and only to it. This cannot be done via the permissions part of the compliance center, it is indeed in the Exchange Online RBAC permissions. The cmdlet Search-UnifiedAuditLog is part of the Exchange Online cmdlets. To give users ability to use that cmdlet you need to assign them the role “View-Only Audit Logs”. Then those users will have to go to “https://protection.office.com/&#8221; and they will be able to perform their search. If I say that you can now audit and get reports of modifications done in O365 like licenses modification ! That would be great, isn’t it ? 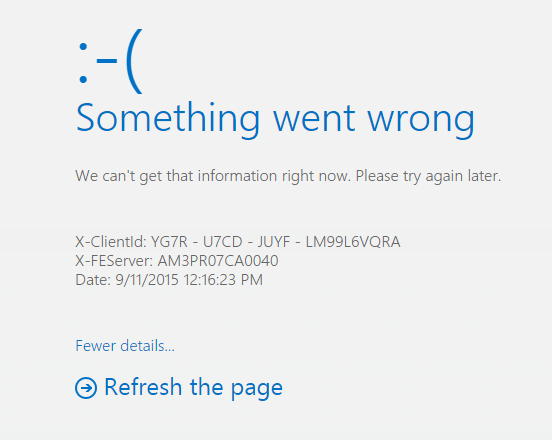 This is now the case, thanks to the feature called “O365 Audit log report”. The “Audit log search” page appear and you can now turn on the feature by clicking on the “Start recording user and admin activities” button. This should take around 2 hours to be effective. You can now use the filter on the item column in order to check modification done on a particular user. This audit and report feature can also be used for Exchange Online and Sharepoint reporting like modification done a document hosted in a personal Onedrive storage. The picture show modifications done on an excel file hosted in Onedrive, one modification has been done by an internal user and the other has been done by an external user. You can search the Office 365 audit log for activities that were performed within the last 90 days. It takes up to 15 minutes after an event occurs in SharePoint Online or OneDrive for Business for the corresponding audit log entry to be displayed. It takes up to 12 hours for events in Exchange Online and Azure Active Directory. Today, I have started to use the new “PST import” process for O365. It is much quicker and reliable than using Outlook. These are your credentials to connect to your azure storage (never share the key). If you want to upload the PST to the online archive of the user, add the parameter “-IsArchive”. If you want to upload the pst into a special folder, set the parameter “TargetRootFolder” with the folder path (Like “Archive_2011”). Then you can run the command “Get-MailboxImportRequest -BatchName NigelMigration | Get-MailboxImportRequestStatistics” to get the status of your batch. If a folder with the same name exist, the process will merge and not create duplicates. It is not as easy as it was with an on-prem Exchange but it is good that Microsoft proposed this workaround. The first choice will work for both O365 and Exchange directly. The third one will also work directly in Exchange on-premise. 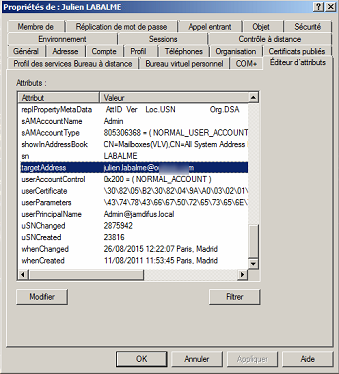 You can create a remote domain per external domain in order to control this feature. I have also performed a mail trace and it was explicit that the email has been moved to the junk email folder ! 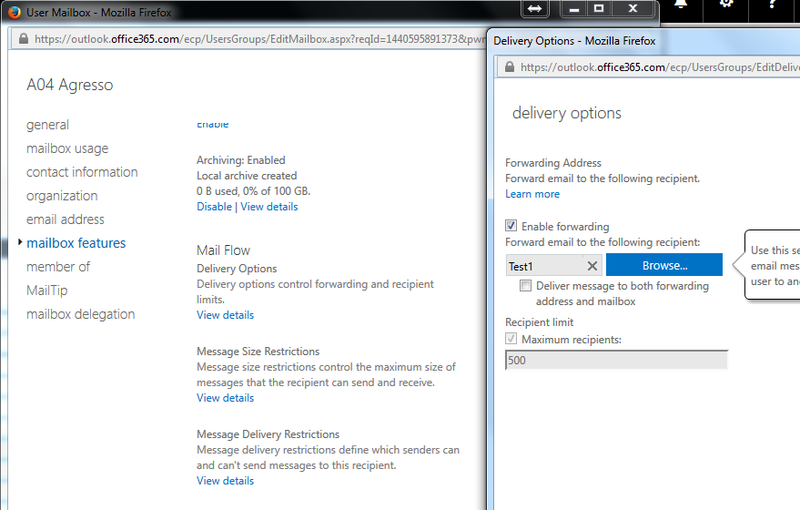 After some search, I found that there is a possiblity to disable and also custom the junk email rule for a specific mailbox. This can be done thanks to this command Set-MailboxJunkEmailConfiguration (https://technet.microsoft.com/en-us/library/Dd979780(v=EXCHG.150).aspx). After running the command Get-MailboxJunkEmailConfiguration for this user, I have effectively seen that for him the rule was disabled ! Why this was disabled, I don’t really know but I think that this was done before the migration to O365 and this setting is kept during the move. So the only solution I found was to export the on-prem mailbox as a pst using the command new-mailboxexportrequest then disable the mailbox (ensure to keep the proxy addresses and every ms exchange custom attributes before launching the command) and finally enable a mail user (report the proxy addresses and the custom attributes if needed).